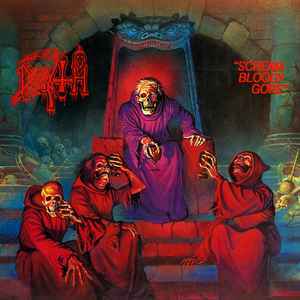 Death's first full length album, originally released in 1987 through Combat Records. R.i.p atmosphere and depth.. the original album can smash your house but the sound from this LP berely want to come out from your speakers.. A low grade digital sound from a low grade remastering work.. Great job "Relapse"
I have a translucent vinyl of this one. Does anybody else have this ? A friend of mine got this release but his LP isn't translucent. does anyone know how to tell the difference between the 1987 US press of the CD and the 1991 US press? More then anything I'm impressed with the cover art. It appears to be inspired from the "Grandpa" scene that was featured in Castle Dracula on Nickels Midway Pier in Wildwood, NJ. That was one of my favorite amusement park rides of my childhood and I still long to ride it to this day even though it's gone. I know famous underground metal acts were doing the rounds in Wildwood back then so its quite possible this art is referencing the scene in that ride. Is this pressing still the remastered version? Anyone? Please... Thanks. 100 bucks for a tape that came off a factory pressing floor less than 2 years ago. Ya'll motherfuckers need Jesus. It claims it was only available through Nuclear Blast mail order in Germany, but I bought this exact numbered to 666 purple version brand new at Rasputin Records in Berkeley California when it was released. So I don't know how accurate that information is.